A man was pushed in front of a London bus during a live BBC broadcast while being chased. 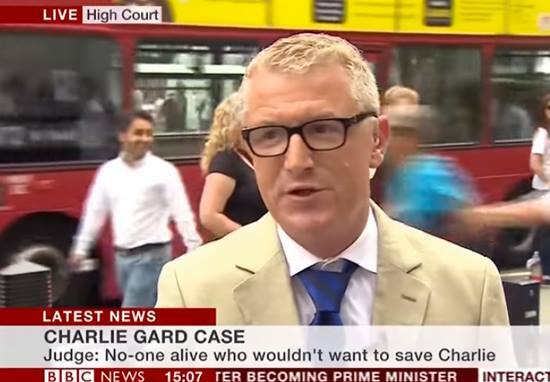 The unidentified male can be seen dashing across the camera as journo Keith Doyle stands outside High Court in the Strand, reporting on the Charlie Gard case. In scenes reminiscent of an action film, the man can be seen running away from another male before being lunged before a passing bus. Passersby jump in horror as they bus screeches to a halt inches from causing any serious injuries. Police were called at 3.10pm on Monday, 10 July, to reports outside the Royal Courts of Justice. A male pedestrian was reported to have been in collision with a bus. The man had an arm injury, which is not thought to be life-changing or threatening. Subsequent inquires showed the bus had not struck the man and this was not a traffic collision. It is not know why the man was being chased.